A lip balm or a lipstick is something that every woman should have in her purse. It happens many times to have pale or cracked lips, because of weather or dehydration and it's important to take care of them and use all natural ingredients. That part is very important , and not only because chemicals can worsen the aspect of our lips , but also because we inevitably swallow lipstick components and that may cause some stomach problems. Nowadays it's easy to find organic and BIO lipstick and lip balms but I personally find them very expensive. Also, the recipe for making one is very easy, and as for containers, you can recycle old ones. 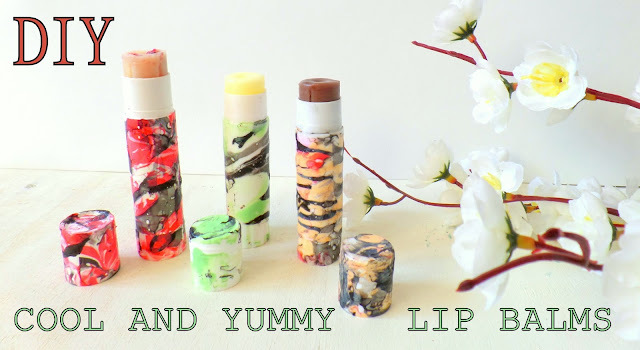 Working on a lot of craft projects has made me realize that the glue sticks we use for paper crafts have the same principle as lipsticks, so why not recycle them? Here is my recipe + instructions for the glue sticks. I made 3 lip balms with 3 different flavors. Please watch the video at the end of this article to see my impressions for the final product. This part is optional. You can leave them white and simple or you can decorate them with washi tape. 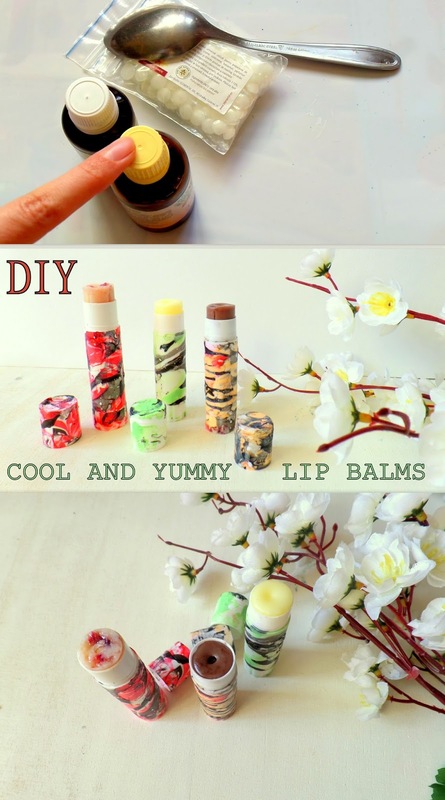 -Put on the lid of glue stick container and dip it in the nail polish mixture. The nail polish will stick on the glue stick and you will create a marble effect. Leave them to dry at least 30 minutes. If you want to skip this step you can do so, and decorate the containers with washi tape. -Next prepare the 3 flavors. In the third cup add half teaspoon of honey and half teaspoon of grated lemon peel . - Next it's time to melt and mix all the ingredients. If you are using a stove, add in a little pot the oils and beeswax and then put the pot above a bigger pot filled with water. Don't put the mixture direct on the flame. Just wait for the water to boil, and the heat from the water will melt slowly the oil or the beeswax. If you are using a microwave, put the oils and beeswax in a bowl safe for microwave and let them for about 1 minute. If still not melted after 1 minute , leave them for more time. -After everything is melted and mixed pour the mixture evenly in the 3 plastic cups and stir. You will have to act fast at this step because the mixture doesn't stay liquid for long time.